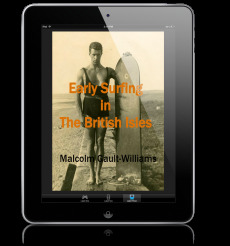 The 1940s – especially after the war – marked the transition from “The Pioneers” to a whole new generation of surfers, some of whom took off from where their elders had left them and some who just marked new tracks in the waves, themselves. The surfing pioneers had been the ones who took surfing and made it into a modern lifestyle. These were guys like “the Father of Modern Surfing” Duke Kahanamoku, innovator Tom Blake, Whitey Harrison, 1930s champion Pete Peterson, paddling legend Tarzan Smith, surf photog extraordinaire Doc Ball, Canoe Drummond and others of their age less well known. A “great change… took place in Duke’s life while he was sheriff,” emphasized another Duke biographer, Joseph Brennan, referring to the entry of Nadine (Nadjesda) Alexander into Duke’s life. “Very soon after they began dating,” Brennan wrote, “Duke was wholly enchanted. She was fair and beautiful, dancing into his skull at night. She laughed a lot – deep, bubbling laughter. When he looked at her his heart rolled over. By this time Duke’s hair was iron gray, but he still had his golden smile and athlete’s body.” She was about 17 years younger than Duke. They married on August 2, 1940, just a few days before his fiftieth birthday. Entering his sixth decade, “What time he could spare from his duties” as sheriff, “was spent in the surf.” In 1950, the Outrigger Canoe Club threw “Duke Kahanamoku Day” on his birthday and had the biggest party in the club’s history, to that point. Duke’s wave knowledge covered the wide spectrum of surfing, outrigger canoeing, and body surfing. Duke confirmed that many of the breaks now commonly associated with surfing were first tested by body surfers. “Did you use fins?” Meaning, was this after 1935? “Well, I tell you,” Duke said, “you see they run in seasons – summer, the waves are terrific out here (Waikiki) and it’s very quiet on the north side. And just the other way – when it’s rough over there it’s smooth on this side. But the waves over there on the north side are terrific. “Well,” Duke answered, “we older fellows – we’d make it a great thing to take care of these kids. The youngsters – we would send back into shore. I know a lot of the boys. Tough Bill, my brothers, and many of these fellows – they’d come out and we’d know they can’t handle the big waves, so we’d send them back in shore. Even by the Second World War, the two most influential surfers were Duke – whose rise in surfing began shortly after the turn of the century – and Tom Blake, who came along about twenty years after Duke began. Between 1939 and 1942, Tom was still shuttling between the U.S. Mainland and Waikiki. He even put in some time with the motion picture industry in Paramount Pictures’ Devil’s Island (1939) and Wake Island (1942). Afterwards, he enlisted in the U.S. Coast Guard, despite being forty years old. He didn’t have to enlist in the Coast Guard, but he did so because, as he put it, “it was the thing to do.” Everyone was pulling for the war effort in the ways they thought they could make their best contributions and, for Tom, it was involvement in the ocean in some way. He enlisted as a temporary reservist on August 27, 1942 and after boot camp and training, he was sworn into the U.S.C.G. regular reserve. Shortly after that, he was appointed a squad and then a platoon leader. He continued to rise in the ranks for the duration of his enlistment, at one point commanding a company of 54 men. Tom’s Coast Guard work amounted to coastal watch in California and Washington State and handling explosives. He left a two-page log of his various tours, written on the inside pages of his Bluejacket’s Manual. These pages document that he first went to boot camp in Wilmington, then to San Clemente Island, California. He spent the fall of 1942 and part of the winter of 1942-43 at Point Arguello, finishing the winter at Port Hueneme. At the beginning of the summer of 1943, Tom developed pneumonia and was hospitalized. Afterwards, he went to Dog Administration School in San Carlos, where he graduated and then went on to serve at the Naval Air Base in Oak Harbor, Washington, in September 1943. From there, he went for training at Ault Field in Clover Valley. Later, in command of forty men and twenty dogs, he established a beach patrol at Swift Beach, located on the Rosarita Straits, in Puget Sound. Early in 1944, he took charge of the kennels at Oak Harbor and was stationed at the Naval Air Station on Whidbey Island. In early summer, he was assigned to the explosive detail at Alameda and San Francisco. From there, he went on to explosives loading in Richmond by the end of the summer. “Knowing the beaches so well,” Tom said, “that’s how I got in… As usual, I took my work too seriously… Most everyone else was trying to get away from the Draft [meaning combat duty]… [My advice to you:] Don’t take it too seriously [anything]; spread it out… I worked day and night. I looked over 40-to-50 men; sent them out on patrols and checked to see that they were on patrol… Later on, we got in on the ammunition loading,” which “used to scare the hello out of me,” Tom admitted. While serving in the United States Coast Guard for three years during World War II, Tom not only gained training handling dogs and expertise in “the unloading of captured Japanese ordinance,” but also taught swimming and ocean rescue. Because of a Headquarters’ ruling on over-age discharges, all enlisted men over the age of 42 were allowed to return to civilian life in the summer of 1945. It was thus that, at the age of 43, Tom received his honorable discharge on July 7, 1945, in Long Beach, California. As soon as Tom was done with his military service, he headed for the beaches: first, Waikiki; then Palos Verdes, in Southern California, and then Miami Beach, Florida. A Honolulu newspaper clipping noted his return to civilian life: “Also returning home Sunday was Tom Blake, who has come back ‘to do some surfing’ after an absence of five years. It was Mr. Blake who developed the hollow surfboard about 15 years ago, and for devotees of the sport who have found surfboards among the ‘shortages’ of these past years, he brought good news. For most people, “indefinitely” means for a long time – not so for Tom Blake. Through the rest of the 1940s, he logged time back on the Waikiki Beach Patrol, but also put in summertime work in various aquatic roles at Palos Verdes. The Palos Verdes peninsula is as unique as Waikiki, in its own way. Situated between Santa Monica Bay and San Pedro Bay, Southern California, it had once been an island during pre-historic times. Uplift of the land mass, combined with sedimentation in the Los Angeles Basin, caused the island to be connected to the mainland. As a result, a series of thirteen distinct marine terraces rise in succession from sea level to 1,480 feet. In the 1800s, the peninsula comprised the rancho of the Sepulveda family. It was later developed in the 1920s as an elegant subdivision of residential estates, incorporating as the City of Palos Verdes in 1939. Three articles Tom wrote in the late summer of 1947 give a more detailed picture of his work at Palos Verdes in the late 1940s. He was mostly headquartered at Malaga Cove on the northeastern-most part of the peninsula, which is closest to the city beaches of Torrance and Redondo. Tom went on to write about the “Mile Club” and the subject of dedication: “Still others swim laps, 52 or more, to make membership in the ‘Mile Club.’ This is a considerable feat, as evidenced by those who fail to swim the required distance… A handsome perpetual trophy is being readied to be given to the boys or the girls; whichever has the most ‘Mile Club’ members.” In describing the Mile Club in more detail, Tom wrote in a subsequent article: “The latest fashion at the Palos Verdes Swimming Pool is to achieve membership in the ‘Mile Club.’ This is an honor group, each of who must swim a mile to qualify. There are no strings attached, and with this goal in mind, kids who never had the incentive to swim the full length of the pool are now navigating a full 52 lengths or more, thereby gaining a greater measure of health and physical benefit that inevitably accompanies a vigorous swim in the open air. Tom’s third article from the end of the 1947 summer was entitled “Swimming Pool Closes After Successful Season,” and it was printed in the Palos Verdes News, September 1, 1947. “An unusually enthusiastic crowd attended and took part in the Labor Day races at the Swimming Club,” he began, “to finish the season with a sunny summer day that topped a perfect record of such days for the months of June, July and August. While highways and public beaches were jammed with city dwellers, the residents of our community found plenty of room to relax and cool off at the club, as well as enjoy seeing the children display their swimming prowess. In his writing of pool competition, Tom referred to the importance of keeping to “the golden rule.” That Golden Rule was the one most of us, hopefully, live by: Do unto others as you would want them to do unto you. In his later years, especially after the war, Tom lived by the true Christian ethic, more than many church-going Christians did then and now. He was an example of a man who came to face life head on and was at peace with it. He made other comments akin to the Golden Rule, such as “Don’t say anything if you do not have positive comments,” or “They are doing the best they can, with what they have.” He would also say, “Stick your head up and somebody will take a shot at it.” Tom’s meaning was clear: if one becomes too vocal about certain issues, he should be prepared to pay a price. Tom’s domain was the Malaga Cove beach and the Roessler Memorial Swimming Pool, a salt-water pool built in 1926. The area had been one of the cradles of Southern California surfing in its earliest days. Just next door to Palos Verdes, Redondo Beach, beginning in 1907, had been where George Freeth had demonstrated surfing the most and built up a core group of lifeguards and surfers that later helped pollinate the rest of Southern California. By the mid-1930s, just to the west of Malaga, Bluff Cove became the prime spot to ride particularly large waves. It was even sometimes referred to as “Little Waikiki” and became a favorite spot of those early Southern California surfers who were members in the Palos Verdes Surfing Club. By the late ‘30s, some of the men regularly surfing Bluff Cove included: Pete Peterson, Tulie Clark, Gard Chapin, Bud Morrissey, LeRoy Grannis, Doc Ball, Adie Bayer, E.J. Oshier, Grant Leonhuts, Jim Bailey, Johnny Gates, Al Holland, Fenton Scholes, Jean Depue, Hornbeck, Jim “Burhead” Drever, Hal Landes, Hal Pearson, Johnny Dale, Art Alsten and others like Tom Blake. Tom was certainly not the only surfing innovator the 1940s produced. Another was Jamison Handy, who remains relatively unknown to this day. Tom first met Jam Handy when Handy was an Olympic champion, many years before in Detroit, just before Tom began his life as a surfer and wanderer. “It was [later] in California [before the war] that he got into some surfing,” Tom said of Handy. “I was making boards then and he come to me for a board and I sold him a board. It was a good board, too, a big tandem board. It was very heavy, though. And then he built his wife a balsa board, which is very light, so she could carry it down the Palos Verdes Cliffs. They used to drag’em [the redwood boards] or put’em on their back [in a sling]. In 1949, Tom made a switch from the Palos Verdes Swimming Club on the north side of the peninsula to the Portuguese Bend Club, further to the south. “Tom Blake,” wrote one sports columnist from the San Pedro News-Pilot, on April 11, 1949, “former national distance swimming champion and inventor of keeled surfboards and hollow paddleboards, is the new director of recreation and swimming at Portuguese Bend Club on Palos Verdes peninsula. Blake, who was with the Waikiki Beach Patrol in Honolulu for 10 years, was national 10-mile swimming champion in 1922. That same year, swimming for the Los Angeles Athletic Club, he finished second to Johnny Weismuller in the sprint and middle-distance events… For the past two years, he has been with the Waikiki Beach Patrol. Tom continued with the Portuguese Bend Club through the summers of 1949 and 1950, but he did not stay with the job beyond that. He said it was because he “couldn’t stand to see kids in trouble every day,” meaning children who would get in the pool without learning to swim, first. If people who knew Tom or knew of him thought he was “out of the game,” traveling between Palos Verdes and Hawai’i and doing little else, they found themselves highly mistaken on the morning of Sunday, June 20, 1948. It was on this day that Tom made a dramatic paddle across the Golden Gate, the opening to the sea from San Francisco Bay, California. The board he rode was a Bob French hollow that Pete Peterson had reshaped. The environment in which he paddled was a very swift-moving and dangerous current. When the United States entered World War II in 1941, Pete initially got a deferment because he was married and worked in public safety. However, Pete’s marriage to his first wife Arlene was not successful and while in the middle of the rocky marriage, he was inducted into the U.S. Navy, on February 18, 1943. By June, Pete had passed all his training in San Diego, testing well due to the fact he was already an accomplished waterman. Because of his lifeguard lieutenant experience and being skilled at handling small craft, Pete was sent to New Orleans to qualify as a Ship Fitter, with the non-commissioned rank of Petty Officer Third and Second Class. Pete completed the New Orleans training and took a two-week leave to visit his son in Santa Monica. Santa Monica’s Captain Watkins reinstated him at the beach for five days so he could earn a little extra money and while there Pete took young Matt Kivlin with him to ride Malibu for Pete’s last surf session before going back on duty with the Navy. This may have been Kivlin’s first taste of Malibu, the break whose style master he would become. Pete went back to train in New Orleans and earned his Petty Officer First and Chief. By November 1944, he had completed both the Navy’s demanding Diving School, its Firefighter’s School and Velocity Power Tool School, going on to qualify as a Diver Second Class. Sometime before the United States entered World War II, legendary paddler Gene “Tarzan” Smith came to know a son of the Alexander Hume Ford family who owned a yacht named the Altair. While Gene was on a long distance sailing trip on the Altair, a devastating storm struck. One of the crewmembers was lost, along with all belongings, and the yacht disabled. Fortunately, the remaining crewmembers, including Tarzan, were rescued by another ship and towed to Pago Pago. In New Zealand, without passports or money, Gene was taken in by the mother of noted actor and swimmer Jon Hall. He resorted to boxing as a way to earn money which eventually got him to Australia and then back to Hawai’i. Gene was married twice while at Waikiki – briefly both times, not surprisingly. His first marriage started off this way: due to his brawny good looks and water skills, he was able to land some small movie parts as a swimmer. While doing that, he met – amongst others – his first wife Evelyn Thorn, whom he married in 1937. Evelyn was a movie starlet of the time and notable for having taken the place of Faye Raye in the movie Tarzan. It’s possible that this may have been a contributory factor to the popularity of Gene’s nickname, but that is just conjecture on my part. At any rate, Gene’s marriage to Evelyn lasted only a short time. Later, he met Katharyn Agness Billhardt when she was vacationing in Honolulu. They met and got to know each other for a short time before she had to go back to the U.S. Mainland. Not long afterwards, Katharyn returned aboard the steamship Lurline and Gene even paddled out to greet her. When her affluent father heard that his daughter planned to marry the infamous Gene “Tarzan” Smith, he threatened to disown her. Undaunted, she married Gene in 1941, anyway. She probably should have listened to her father, as the two divorced after only two years together. Gene had just turned 30 when the Japanese attacked Pearl Harbor. Switching from the beach to the pavement in an amazing twist of fate for a brawler, Gene got a job as a policeman in the Honolulu Police Department. While there, he became close friends with the sheriff. No doubt for other reasons as well, Gene ran afoul of his own fellow policeman by not only being the one haole on the force, but also the one closest to the sheriff. One fateful night, Gene took a date to the Royal Hawaiian Hotel and later dropped her off at home. While the night was still young in his mind, Tarzan went to a downtown bar for a few drinks with the sheriff. After the sheriff went home, Gene continued to drink until drunk. Four of his fellow H.P.D. officers caught him in an alley outside the bar and beat him brutally, breaking his jaw, one of his legs and causing a severe concussion to the head. It took four of them to do all this to a wasted Tarzan. Gene ended up in the hospital for a number of months and, according to his family, never fully recovered. His sister Phyllis said that this episode caused him to become deeply paranoid and schizophrenic from that point on. A local restaurant owner named Spence Weaver cared for Gene during his recovery and let him live on his boat moored at Ala Wai harbor. Gene had taught Weaver’s two sons how to surf. A local attorney took up Gene’s case and sued the Territory of Hawaii successfully. Gene was awarded lifetime care, including medical, dental and lodging. With lifetime care awarded him but a life nevertheless severely beaten, Tarzan’s trail grew faint after World War II. It was not a short trail, but one of a good forty years more – most of which we know very little about. It was a time when the man who was a mystery even to his friends perhaps became a mystery to himself. Throughout the three decades spanning the early 1950s into the early 1980s, he remained a legend to those who knew of him and a loner to those who actually knew him. It would appear that the first part of his remaining three decades was spent around Honolulu and the later part back in Southern California, where his life at the beach had begun. Just before the war began, at age 23, Granny got a job as a laborer at Standard Oil in El Segundo and worked his way up to boilermaker. In his free time, he continued to surf until World War II blew the entire California surfing scene apart. In 1943, while his brother Don patrolled Malibu as a Marine, Granny joined the Army Air Force and trained to be a pilot. Toward the end of the war, he became a flight instructor. After the war, he toyed with becoming a commercial pilot, but opted to go back to Standard Oil. He then went to work for Pacific Bell Telephone, where he worked in management for 31 years before retiring in 1977. Meanwhile, Granny and Katie had a family on their hands, which meant that surfing and hanging out at the beach became less of a priority than raising four kids. Brennan, 1994, pp. 185,187 and 188. Longboard Magazine, Volume 11, Number 12, May/June 1997. Obituary by Sandra K. Hall. Nadine passed away on July 17, 1997. Timmons, 1994, p. 33. Nadine Alexander quoted. Timmons, 1994, p. 32. Fred Hemmings quoted. SURFER Magazine, mid-1960’s interview with Duke Kahanamoku. SURFER Magazine, mid-1960’s (1963) interview with Duke Kahanamoku. Newspaper clipping, May 19, 1942, “Waikiki To ‘Wake’”. Tom hand wrote on it: “June 1942.” This section on Tom Blake taken from TOM BLAKE: The Uncommon Journey of a Pioneer Waterman. Lynch, Gary. Thomas Edward Blake Interview, April 1988. Tom’s notations. Blake, Tom. “Log of Thomas E. Blake, Sp. 1/c, U.S. Coast Guard,” Tom’s short personal log. Lynch, Gary. Interview with Tom Blake, June 26, 1988. Lynch, Gary. Biographical Sketch of Tom Blake. Tom’s own written notation. Honolulu newspaper clipping, “Tom Blake Back,” 1945. California Coastal Resource Guide, ©1987, State of California, p. 302. San Pedro News-Pilot, “Portuguese Bend Club Names Blake,” April 11, 1949, p. 9. Blake, Tom. “‘End of Season’ Swimming Pool Notes,” pubication “the News” unknown. 1947. Blake, Tom. “Swimming Pool has ‘Mile Club’ Activity,” publication unknown, August 14, 1947. 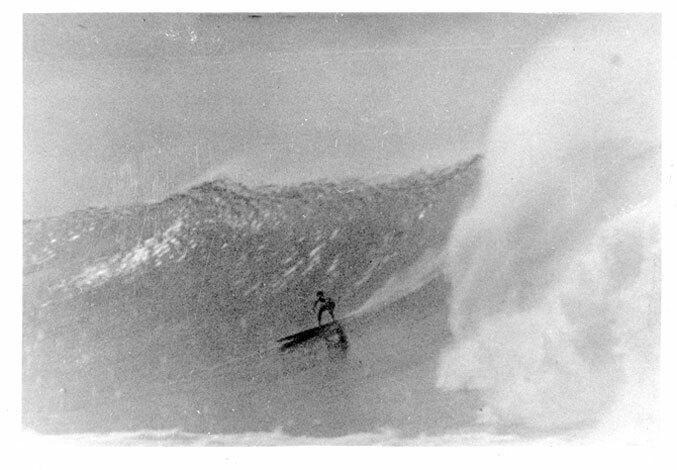 Mike Eaton went on to become a renowned paddler and shaper. Blake, Tom. “Swimming Pool Closes After Successful Season,” Palos Verdes News, September 1, 1947. Tom noted he was then Director of Pool Activities, working at a rate of $200/month, from June 15 to September 1. Blake, Tom. “Swimming Pool Closes After Successful Season,” Palos Verdes News, September 1, 1947. Ball, John “Doc.” Early California Surfriders, ©1995, p. 41. Ball, John “Doc.” Early California Surfriders, ©1995, pp. 39-64. Lynch, Gary. Interview with Tom Blake, July 25, 1988, Washburn, Wisconsin. The Florida connection may have been the Whitmans. See Portuguese Bend Club, Rancho Palos Verdes, announcement May 1950. San Francisco newspaper clipping, newspaper unknown, June 21, 1948. Lynch, Gary. Interview with Dudley Whitman, May 10, 2000. Lynch, Gary. Interview with Tom Blake, April 16, 1989, Washburn, Wisconsin. Blake, Tom. Postcard to Gary Lynch, October 29, 1986, from Washburn, Wisconsin. Lynch, Gary. Thomas Edward Blake Biography Interview, April 1988. Tom’s notes. Blake, Tom. Letter to Tommy Zahn, p. 7. Blake, Tom. Letter to Tommy Zahn, pp. 7-8. Lynch, Gary. Interview with Tommy Zahn and Chauncy Granstrom, July 27, 1988. Zahn, Tommy. Letter to Gary Lynch, June 2, 1988. Some Rogers boards had the drain plug aft, some in the bow. Most were on the bow. James, 1996, p. 136. Don’s written caption to Pete Peterson and Jack Fuller at the Venice Pier, 1940, on p. 95. This section on Pete taken largely from LEGENDARY SURFERS Volume 3. See also Lockwood, 2005-2006, p. 58. Lockwood, 2005-2006, p. 59. John Peterson quoted. Foster, Steven. “Gene ‘Tarzan’ Smith Pictorial Biography,” December 16, 2003. Power Point presentation. In Australia, John Hall’s mother, 30 years Gene’s senior, took him in until he could make it back to Hawai’i. This section on Tarzan is taken from LEGENDARY SURFERS Volume 3: The 1930s. Foster, Steven. “Gene ‘Tarzan’ Smith Pictorial Biography,” December 16, 2003. Foster, Steven. Email to Malcolm, January 3, 2004. Foster, Steven. “Gene ‘Tarzan’ Smith Pictorial Biography,” December 16, 2003. Some say Gene was let go by the Department because of how he roughly handled people in the line of duty. Given his personality, this probably went on to some degree, but was not the cause of his separation from the H.P.D. Photo: Grannis -- Surfing’s Golden Age, 1960-1969, ©1998, p. XII. Gault-Williams, Malcolm. Interview with LeRoy Grannis, Carlsbad, California, 26 June 1999. Gault-Williams, Malcolm. Interview with E. J. Oshier, October 10, 1998. Longboard, Volume 4, Number 5, November/December 1996, p. 18. Stan King quoted. Two bits equals one quarter ($0.25). Gault-Williams, Malcolm. Interview with E. J. Oshier, October 10, 1998. E.J. mentioned there was one PVSC guy he didn’t get along with, but I didn’t catch the name.